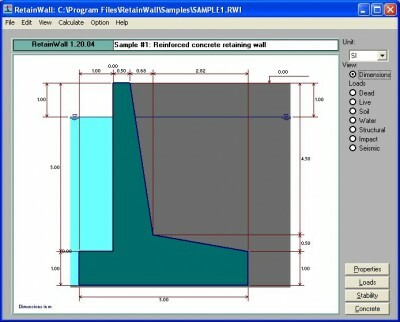 RetainWall 1.20.04 is math & scientific tools software developed by JavaSoft. RetainWall is a software mainly designed for the purpose of designing a concrete or masonry retaining wall. The wall may retain soil or other granular material. It analyses the stability of the wall based on the loads and the resulting base pressure, sliding and excentricities. Loads applied on the wall may consist of self weight, soil pressure, water pressure, live and seismic loads. 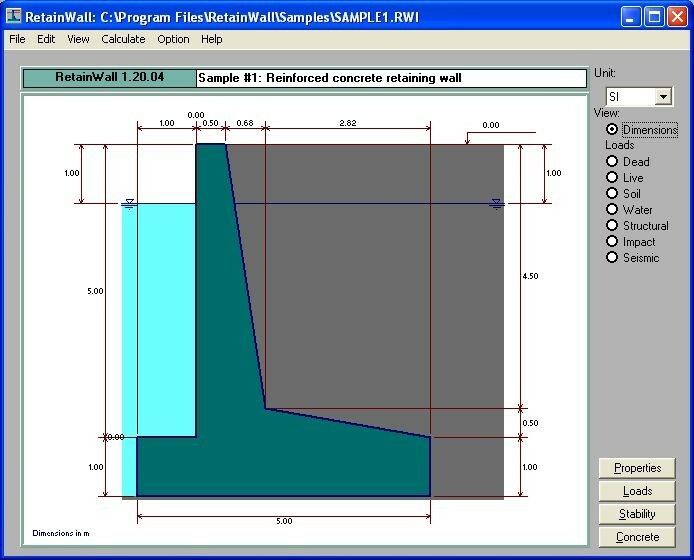 RetainWall 1.20.04 supports English interface languages and works with Windows 98/XP/Vista. We have tested RetainWall 1.20.04 for spyware and adware modules. The software is absolutely safe to install. Our website has thoroughly tested business product RetainWall 1.20.04, written the review and uploaded installation file (2197K) to our fast server. Downloading RetainWall 1.20.04 will take minute if you use fast ADSL connection.